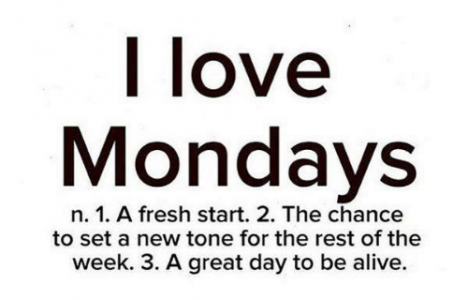 TGIM and a Happy Monday to you! I want to start this amazing Monday with a quote from Mr. Rocky Balboa. Sometimes life is hard, even for Coach Matt. Sometimes life is rough. I may want to paint a nice picture of my life on Facebook or social media or even in my TGIM posts and blog. But no life is not always fun and uncomfortable times and bad things do happen. Life is not always sunshine and rainbows as Rocky would say. But you just have to keep your head up and keep fighting. Keep going on and making slow steady progress. This video below really spoke to me today about this topic so I am including it for your viewing pleasure. So in the hard times I say – Never give up. Keep working on yourself. Keep working on your dream. Keep working on being your best self. Keep moving. Keep working out. Keep eating healthy. Do your best. QUOTE OF THE DAY: “Don’t ask yourself what the world needs. Ask yourself what makes you come alive and then go do that. Because what the world needs is people who have come alive.” ~ HOWARD THURMAN. I have also read that quote from a book by John Eldridge called Wild at Heart – I highly recommend that book. Today I also grieve the passing of my Father who died 11 years ago today. RIP DAD! Love you and miss you!